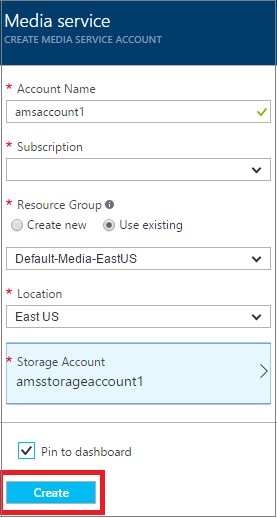 The Azure portal provides a way to quickly create an Azure Media Services (AMS) account. You can use your account to access Media Services that enable you to store, encrypt, encode, manage, and stream media content in Azure. At the time you create a Media Services account, you also create an associated storage account (or use an existing one). If you delete a Media Services account, the blobs in your related storage account are not deleted. You can have General Purpose v1 or General Purpose v2 as your primary storage account. Currently, the Azure portal only allows picking v1 but you can add v2 when creating you account using the API or Powershell. For more information about storage types, see About Azure storage accounts. The Media Services account and all associated storage accounts must be in the same Azure subscription. It is strongly recommended to use storage accounts in the same location as the Media Services account to avoid additional latency and data egress costs. 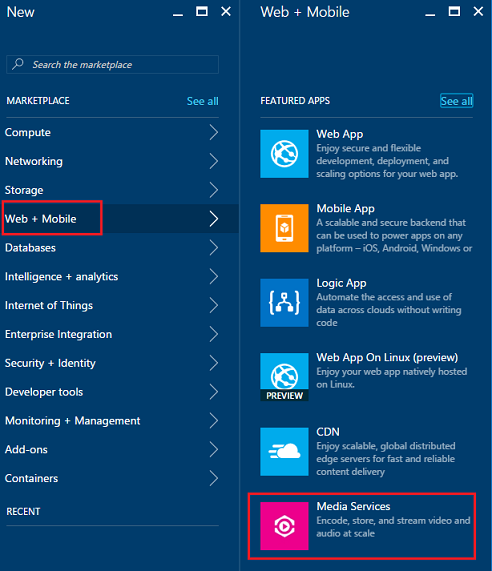 This article shows how to create a Media Services account using the Azure portal. For information about availability of Azure Media Services features in different regions, see availability of AMS features across datacenters. To complete this tutorial, you need an Azure account. For details, see Azure Free Trial. The steps in this section show how to create an AMS account. Click +New > Web + Mobile > Media Services. In CREATE MEDIA SERVICES ACCOUNT enter required values. In Account Name, enter the name of the new AMS account. A Media Services account name is all lowercase letters or numbers with no spaces, and is 3 to 24 characters in length. In Subscription, select among the different Azure subscriptions that you have access to. In Resource Group, select the new or existing resource. A resource group is a collection of resources that share lifecycle, permissions, and policies. Learn more here. In Location, select the geographic region that will be used to store the media and metadata records for your Media Services account. This region will be used to process and stream your media. Only the available Media Services regions appear in the drop-down list box. In Storage Account, select a storage account to provide blob storage of the media content from your Media Services account. You can select an existing storage account in the same geographic region as your Media Services account, or you can create a storage account. A new storage account is created in the same region. The rules for storage account names are the same as for Media Services accounts. Select Pin to dashboard to see the progress of the account deployment. Click Create at the bottom of the form. Once the account is successfully created, overview page loads. In the streaming endpoint table the account will have a default streaming endpoint in the Stopped state. To manage your AMS account (for example, connect to the AMS API programmatically, upload videos, encode assets, configure content protection, monitor job progress) select Settings on the left side of the portal. From the Settings, navigate to one of the available blades (for example: API access, Assets, Jobs, Content protection). You can now upload files into your AMS account. For more information, see Upload files. If you plan to access AMS API programmatically, see Access the Azure Media Services API with Azure AD authentication.